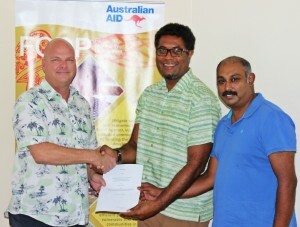 The Australian Government funded Fiji Community Development Program (FCDP) and Habitat for Humanity (Fiji) have entered into an agreement valued at nearly FJD500,000 to construct water and sanitation projects in 16 vulnerable communities around Fiji. These projects were identified through a process of community engagement and community development planning facilitated by FCDP in conjunction with a number of Civil Society and community-based organisations in Fiji. The projects that will be implemented over the next 6 months, have resulted from an inclusive partnership approach between 10 Civil Society Organisations (CSOs)and 16 communities. CSOs assist communities to develop plans that prioritise community needs and theseplans have been endorsed at the local government level. Habitat for Humanity Fiji Director Masi Latianara added that the assistance to the 16 rural communities will bring new opportunities in health and hygiene to the lives of the community members. The Civil Society Organisations involved in thecommunity planning process are: Cakaudrove Provincial Youth Council, Catholic Women’s League, CCSS Ba Methodist Church, Community Centred Conservation, Citizen’s Constitutional Forum, Northern Multiracial Community Initiative, Ra NaariParishad, Save the Children and Youth with a Mission. For further information please contact FCDP’s Communications Officer Sunayna Nandni: Sunayna_Nandni@fcdpfiji.org or 9306750.